Are you ready for the next best performing portable Bluetooth speaker? If the answer is yes, we’re glad to introduce you to Bose SoundLink Revolve. It’s made to deliver a constant 360° sound and provide you with the ultimate listening experience, wherever you go. Thanks to its size, it’s perfect for taking it outdoors. But don’t let the size fool you, it’s equipped with the latest technology. To be specific, it comes with dual passive radiators that will provide deep lows and perfect levels of vibration. The transducer is there for a full range sound while the pressure trap eliminates weird noises and keeps clean tones. Finally, the acoustic deflector provides a 360° sound experience. 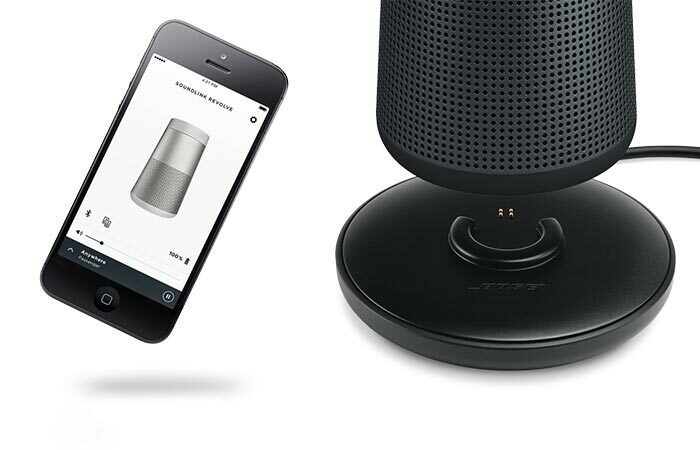 Bose SoundLink Revolve is portable, small and compact. It provides a full 360° sound range and comes with a powerful 12-hour battery. 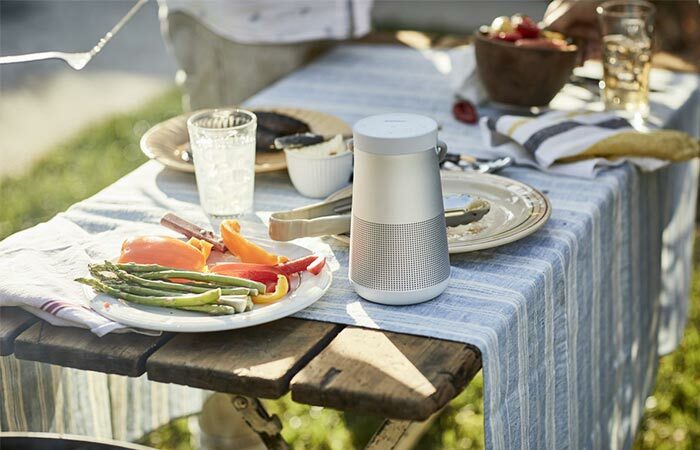 Bose SoundLink Revolve is water resistant, so you can keep it near a pool or on a kitchen counter and not worry about a few potential drops coming its way. The materials are soft, meaning you can drop it a few times and it will still look as new. The minimalistic and elegant design is achieved with a new single-extrusion crafting process. This speaker is water resistant and perfect for both indoors and outdoors. 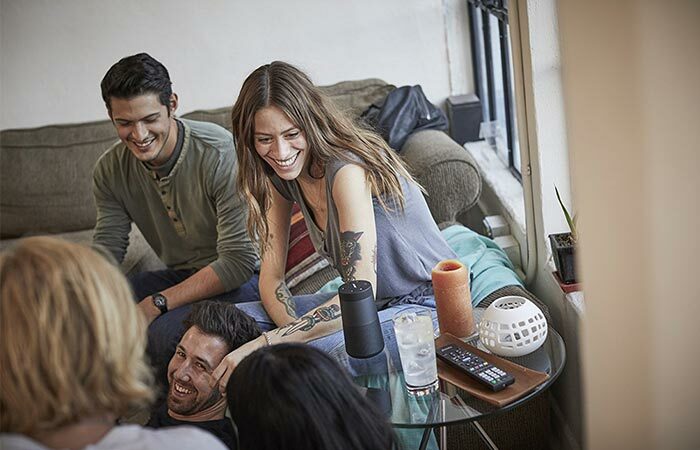 One of the best features of Bose SoundLink Revolve is its powerful rechargeable lithium-ion battery that can last up to 12 hours. The top of the speaker is where the buttons are. They are soft to the touch and easy to operate with. The multi-function button, for example, lets you access the voice input for Siri and Google Now right from the speaker. Not to forget that you can connect it to an app that then lets you pair two speakers and put them in a Party Mode or switch to Stereo Mode. The app and the charging station. You can choose to get an optional charging cradle and not move the speaker when you’re charging it and listening to music. 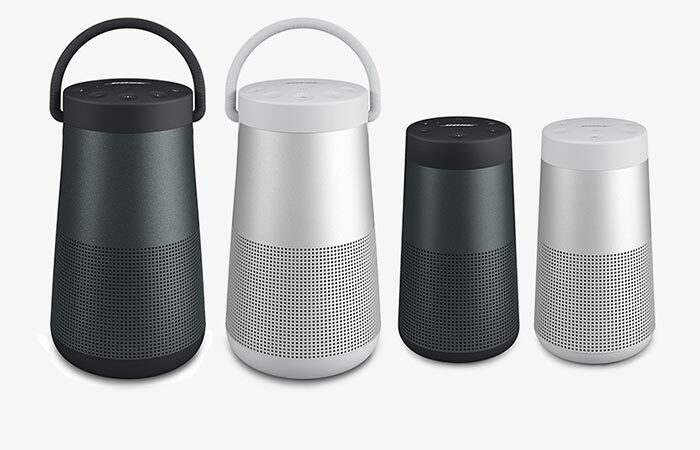 As for the speaker itself, it comes in two sizes, the Bose SoundLink Revolve that measures 5.97 x 3.24 x 3.24 inches and weighs 1.46 lbs and the bigger Bose SoundLink Revolve+ measuring 7.25 x 4.13x 4.13 and weighing 2 lbs. Both available in black and white.